In this section, we will show you the updates we are making for 2013. While the elements never failed to function, we noticed some things after the season was over that we thought we could address and resolve before we put them back out. We think these are updates that are WELL worth the efforts. I always have good intentions of photo documenting all of my projects. However, sometimes I get in to the project and right at the end realize I forgot to take pictures. This was one of those times. I did manage to get a few critical pictures showing more of WHY we did this update instead of how. The how is pretty obvious, it hits you like a ton of bricks. Here is the WHY !!!! Pin 1 and 2 (the orange pair) are the DMX signal pair. The remaining 6 connectors carried the power. Notice the corrosion and apparent arcing that went on. None of the lights ever failed, but this is just a failure begging to happen. 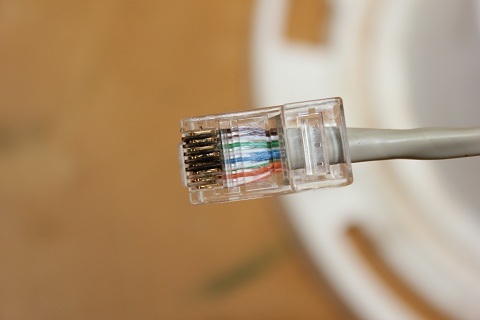 The cable shown is the cable that exited the North Pole and plugged into a 3-way RJ45 splitter. The splitter looks just like this connector. Here is the final result. A male and female waterproof connector. Although not shown, I did use a dab of hot glue where the wires go into the pole. I also drilled a hole in the base. In 2012 I found the globes let a little water run past them and it accumulated in the bottom. This will keep the tube from filling with water. Here we are on the test bench with 4 North Poles linked together. 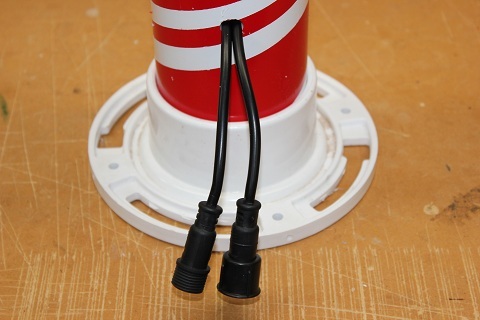 For 2013, we updated the DMX controller box to output only the DMX signal. The DMX controller can use CAT5 from the controller to the power supply (shown unmounted to the right of the laptop). 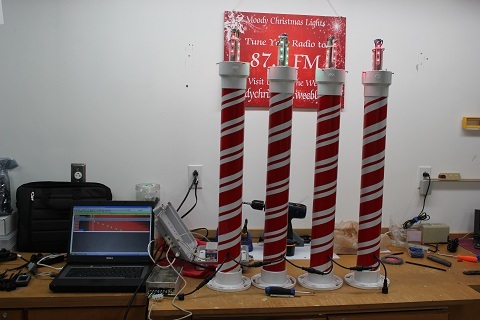 From there, the DMX signal and power are merged and sent via 18ga, 4-conductor cables to each of the poles. See the extension how-to below. 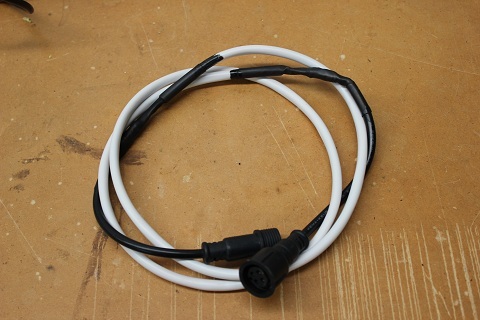 After replacing the CAT5 connectors with 4-pin waterproof connectors on the North Poles, we needed interconnect cables. The pictures below show how simple it is to make the cables. We used 18ga. 4 conductor wire and waterproof conectors purchased from a vendor off of AliExpress.com. Here are the two ends. 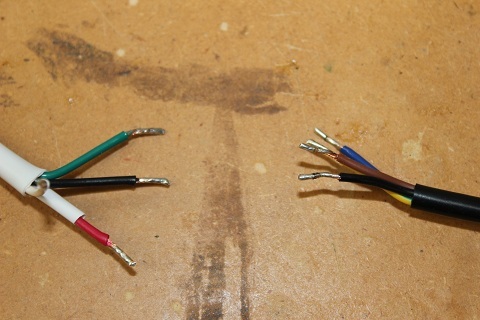 The ends on the left are the 18ga 4-conductor wire and the ends on the right are to male or female end of the waterproof connector. Note the ends are striped and tinned. 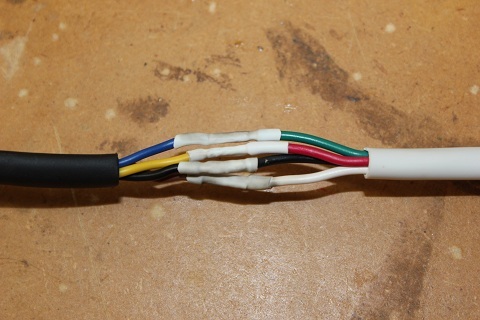 Also note on the red wire there is a piece of white heatshrink tubing pushed under the insulation. This will slide over the soldered joint. With the tinned ends in place, I place a little solder on the tip of my iron and just touch the joint. 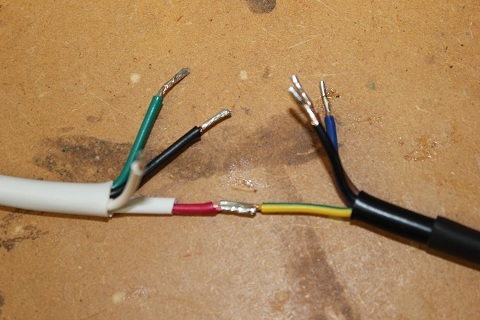 The solder flows readily and doesnt over heat the wire. 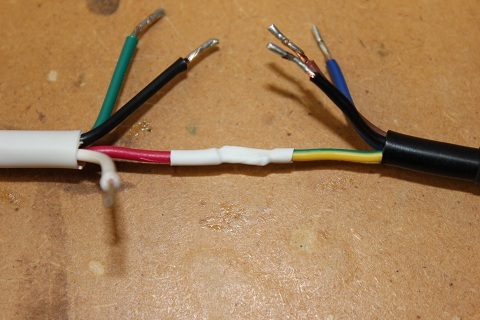 Here are all the wires soldered and the heat shrink in place. I did use a lighter. The black streaks you see are from the flame. 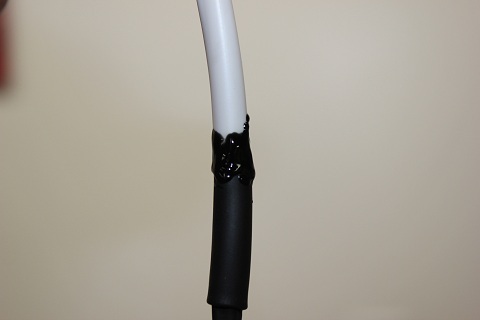 As long as you dont over heat and melt or rip the tubing the joint is fine and protected. 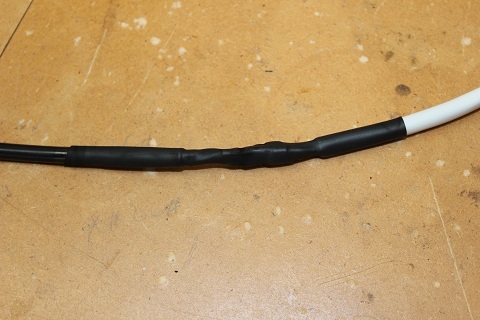 Before I began, I cut heatshrink tubing and slipped it over the black wire of the connector. 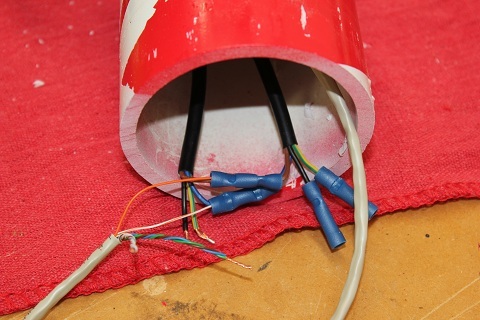 Once the individual wires are soldered and covered, slide down the long piece of tubing to cover and seal it all up. Here again I used a lighter to shrink the tubing. This tubing has a much higher heat rating than did the little white pieces shown earlier. 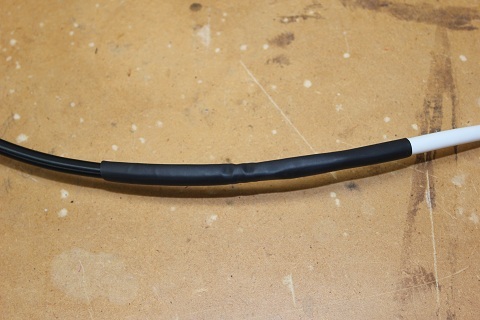 It took a little longer and a little more heat to get this tubing to shrink to its smallest size. This is where a commercial heat gun really comes in handy. I used a little dab of liquid electrical tape to seal the ends. May not have been necessary but it adds a little extra water proofing to the project. Here is the completed cable. Its just a little over 5' long. We set up the North Poles and measured to determine the lengths needed. You will, of course, have to determine your requirements.